in the CFL from 1979 to 1981. He may be best remembered by most people as the actor who played O.J. Simpson in the TV movie, but I remember him as a hard-hitting defensive back with the Saskatchewan Roughriders when they were trying to gain respectability in the 1980s. Recently, I saw an old episode of “Bones” on DVD, and Bobby Hosea was making a guest appearance. It took a bit of digging because Wikipedia is pretty thin on information, but Bobby Hosea the actor used to be Bobby Hosea the Canadian Football League player. Bobby Hosea in his Montreal Alouettes uniform. Bobby Hosea played three seasons in the CFL. He joined the Montreal Alouettes in 1979, where he played 13 games and intercepted two passes, returning them a total of 24 yards. He also returned two punts for 10 yards. The Alouettes made the Grey Cup that year, but lost to the Edmonton Eskimos by a score of 17-9. The next season he suited up with the Saskatchewan Roughriders. Hosea played in 15 games, had two more interceptions that season for 24 yards, returned two kick offs for 32 yards, and returned three punts for 22 yards. His final season was his best defensively. In 1981, he played all 16 games and intercepted four passes for 30 yards. He returned one kick off for three yards and returned one punt for nine yards. The most memorable episode of his career came in a 30-26 loss against Hamilton on Oct. 4, 1981 at Taylor Field in Regina. The Roughriders were in the hunt for a playoff spot, after years of futility. With three minutes and seven seconds left and Hamilton leading 23-12, Saskatchewan stopped the Tiger Cats short on a key second down play. Hosea got into a shoving match with Tiger Cat slotback Gordie Paterson then punched him. He was flagged for rough play and ejected from the game. The penalty gave Hamilton a first down. Theyt would proceed to go down the field and score a touchdown that turned out to be the winning points. The incident marred a solid game for Hosea where he intercepted a Tom Clements pass. To his credit, after the game Hosea apologized to Bud Riley, Hamilton’s defensive coach. The next day CFL Comissioner Jake Gaudaur fined Hosea $300, but chose not to suspend him because he had no previous record of bad conduct. Bobby Hosea would also play for the Los Angeles Express and Jacksonville Bulls of the United States Football League, but at age 28 decided he had taken enough of a beating and retired from football. His first credited appearance on the screen was in a TV movie called “Her Life as a Man”. Before the end of the decade he would make appearances in movies, as well as TV shows such as “Benson”, “Perfect Strangers”, “Knots Landing”, “The Twilight Zone”, “21 Jump Street”, and “227”. I have always been interested in connections. When you really look at things, the world can become a very small place. I’m also absolutely fascinated by the number of people with connections to the CFL. Bobby Hosea would go on over the next 30 years to appear in some major movies such as “Independence Day”, and “61*”. He also made a name for himself playing high-profile killers and accused murderers such as the title character in 1995’s “The O.J. 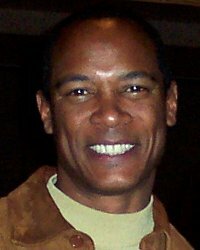 Simpson Story” and John Allen Muhammad the title character in “D.C. Sniper: 23 Days of Fear” (2003). His latest claim to fame is coaching football, and teaching kids a safe way to tackle. But back in the 1980s, he was a fresh and pretty faced defensive back for the Saskatchewan Roughriders. It just shows, all roads run through the CFL, and there is life after football.